This is our brand new and high quality folding Treadmill, which could make you get more results in less time. Your home is your gymnasium. It helps you keep fit, prevent diseases, and decrease the stress of life or work as well. This folding Treadmill is ideal for everyday running workout fitness. It features easy-fold design for easy storage and heavy-duty steel frame. Once you own this treadmill and exercise with it every day, you will lead a healthier and happier life. The incline could be adjusted in 3 levels and will increase the intensity of your workout. Don't hesitate to buy one, This Treadmill is right for you! 【Heavy Duty Construction & 2.25 HP Impulse Max Motor】Made from high quality steel, the capacity of the treadmill is up to 250lbs, as far as possible to meet your needs. 2.25 horsepower quite impulse motor deliver power for interval, speed, or endurance training. Don't worry it will make big noise to bother people downstairs. 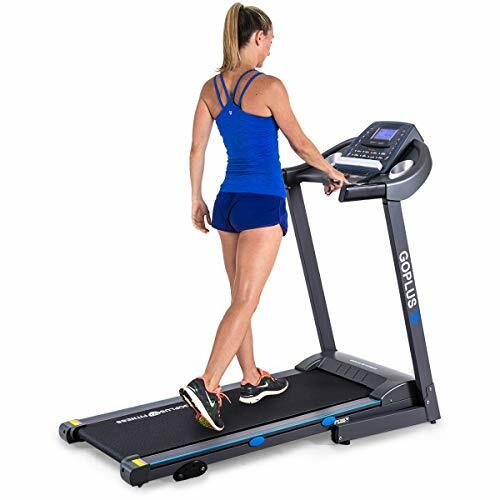 【5" Blue-Ray LCD Display & 17" X 47" Rubber Running Belt】Features with 5" blue-ray LCD display, this treadmill provides better watching experience. It shows Time, Distance, Calories, Speed, Pulse and Incline. 17" X 47" big rubber running belt provides more comfortable and more stable workout experience. 【Adjustable Incline Level& Speed】The inclination of this treadmill could be manually adjusted in 3 levels, helps you burn more calories, tone more muscle, and build greater endurance. Running speed of this treadmill could be adjusted from 0.5-7.5MPH.You could choose different speed base on different workout purposes. 【Foldable design & Cushioning Design】Easy folding mechanism and a soft drop system to help you fold and unfold your treadmill safely and with ease. This treadmill also feature with 4 silicone pads, 2 on each side of the machine, which can reduce noise and descrease vibration to your floor efficiently. 【Safety Key & 12 Built-in Workout Programs】Safety Key connect you and the machine, emergency stop button on the handrail, which double protect you while working out. 12 built-in programs are available for you to choose, these easy-to-use exercise programs help to improve your cardiovascular fitness, boost your health, and burn fat.